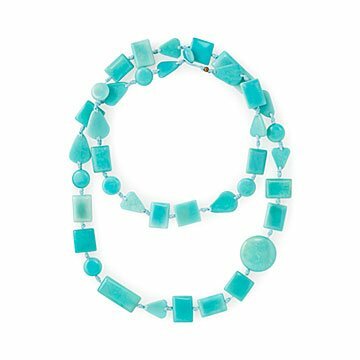 Keep this blazing design as a long single strand, or wrap it twice so its beads coalesce in spirited pattern. For Tibetan monks, teal symbolizes the infinity of sea and sky. Egyptians believe its blazing pigment holds truth and faith. When you wear this bright piece, you might remember these ancient sentiments, but you might just bring out the color of your eyes. Each bead is delicately carved from tagua nuts found deep within the Ecuadorian rainforest. Keep it as a long single strand like falling water, or wrap it twice so its beads coalesce in spirited pattern. Handmade by Paola Delgado in Ecuador. We spoke with Paola about her background, her love of tagua, and her relationship to her artisans. Read more on our blog. Do not submerge in water. Wipe clean with damp cloth. I was drawn to the bright clean color and love the variety of shapes. Great no-fuss necklace in a color that looks great with lots of combos!